May 5, 1911: “TO MANUFACTURE 10,000 TONS OF SALT—Ten thousand tons of salt will be manufactured in Kern County within the next twelve months unless some unforeseen obstacle is thrown in the path of the Diamond Salt Company to prevent that corporation from accomplishing this end. Numerous vats of 40,000 square foot evaporating surface are being built at Kane Lake on the desert, twenty miles south of Randsburg, and as soon as this work is completed water will be turned into them from which the salt will be extracted by the sun evaporation process. The vats are 200 feet square. They are constructed in the style of levees and mud reinforced with lumber, which will give them ample strength to hold the water, an in such a manner that little loss of water will be experienced through seepage. Several large wells are being drilled and windmills installed for furnishing fresh water to the works and the enterprise, when in operation, will be one of the largest, aside from the oil industry in the county. Allowing that a small sack of salt weighs approximately five pounds, which is said to be about the average, the annual output at the plant on the desert will be approximately 3,000,000 sacks. The salt industry in Kern County is a practically new one, and it opens up a tremendous field on the desert where water can be obtained. The Diamond Salt Company which is handling this enterprise is one of the largest manufacturers of salt in the world and with sufficient funds to thoroughly handle every branch of the industry. Kern County is assured of a new and attractive industry of immense proportions. May 6, 1911: “DESERT WASTE CAUSES AMAZEMENT –A territory only lately thought to be hopeless is now becoming so thickly settled that the Bakersfieldian who occasionally wanders into it is amazed. Farming on the Mojave and arid sands and industrial development in the neighborhood of Randsburg and Johannesburg have ____ together. December 8, 1912: “CHARLES KOEHN SELLS FAMOUS SALT SPRINGS—Parts With Property Over Which He Had a Battle Last Winter –Randsburg, December 7. –The Salt claims at Kane Springs, the ownership of which was in dispute and gave rise to a lively battle on the dry lake last January, have changed hands. Charles Koehn, the original locator, made the acquaintance of Thomas Thordkildsen during the trial in the local justice court, which case was the result of the gun fight over the ownership of the claims. Koehn sold his claims to Thordkildsen shortly afterward who in turn recently disposed of them to the Diamond Salt Company of Los Angeles. July 21, 1912: “Notice of Assessment –The Kern Salt Corporation, a corporation organized and existing under and by virtue of the laws of the State of California, with its principal place of business at No. 603 Beacon Street, San Pedro, (now the City of Los Angeles) California and whose property is located near Mojave, in the County of Kern, State of California. Notice is hereby given that, at a meeting of the Board of Directors of this corporation, held on the 10th day of August 1912, an assessment of 3 cents per share was levied upon the subscribed capital stock of the corporation, payable immediately to Frank F. Fleming, the Secretary of the corporation, at the office of the corporation, 603 Beacon Street, San Pedro, California. Any stock upon which this assessment shall remain unpaid on the 15th day of October, 1912 will be delinquent and advertised for sale at public auction, and if payment is not made before, will be sold on the 15th day of November, 1912, to pay the delinquent assessment, together with the costs of advertising and expense of sale. FRANK F. FLEMING, Secretary, 603 Beacon Street, San Pedro, Calif. Dates of publication, August 21, 28; September 4, 11, 18, 25. April 28, 1916: “MAKING SALT – AN INDUSTRY OF THIS DISTRICT—One of the most important industries in this end of Kern County is that operated by the Consolidated Salt Company at Saltdale on the dry salt lake 28 miles north of Mojave. For several years many parties held mining claims in the vicinity until some prominent men of Southern California, consolidated all the interests and went to work to produce salt. J. R. Burns of Los Angeles, is president of the company, J. C. Weatherwax has charge of the works as superintendent and Guy Posson is the company’s secretary. Mr. Posson recently entertained the writer and a party of visitors by showing them the process of making salt and explaining to them all the details of the works. The briny water is pumped from a ditch, which runs out into the lake a mile and a half. The ditch is about six feet deep. The brine which is 36 per cent salt is pumped into an immense vat 43 acres in extent, the floor of which is six inches of solid salt. Forty-eight inches depth of water in the vat will produce eighteen inches after evaporating from 60 to 90 days. Besides the large vat there are six others seven acres in area which are filled and evaporated in the same manner. The salt taken from these vats lack less than half of one percent of being pure. About 90,000 tons were produced during the past year. Eight to ten carloads is the capacity of the plant at the present time with 65 men employed, and the railroad facilities are inadequate to handle it. The company is hoping soon to see another train added to the service to handle the product as they are five months behind in their orders. The four-story mill is being built near the railroad and a new pump will soon be installed at the south end of the lake. With these in operation the capacity will be doubled and about 25 more men will be put on the payroll. The formation of the salt is a peculiar feature of the process. As the water evaporates small flakes of salt form on the surface. When these are about an inch in extent they sink to the bottom forming the hard bottom. This continues until the evaporation is complete. The water goes into the vats in a state of 85 per cent saturation or in other words, holding almost as much salt as is possible to dissolve in water. The harvesting of the salt beds in the vats is accomplished by means of a circular saw attached to a portable base, which moves along cutting the salt in the same manner as natural ice is cut. Movable tracks are placed on the surface, cars are run on these and the salt loaded and taken to the mill, where it is ground to the quality desired and sacked. December 16, 1919: “MOJAVE: SALTDALE salt works shipping from 3 to 11 cars daily.” –Corona Daily Independent. November 17, 1919: “SALT INDUSTRY IN KERN LEADS IN WEST; FOURTH IN THE ENTIIRE U. S. –Salt Works at Saltdale Shipping From 3 to 11 Cars Per Day.—W. S. Proctor, Manager of the Salt Works at Saltdale, located between Randsburg and Mojave, has received a very gratifying report on the concern from the United Sates Railroad Administration, and on in which the entire county may take pride, as it places Kern in a very prominent position in the salt producing industry of the United States. Mr. Proctor visited T. F. Burke in Bakersfield today, and told the county assessor of the word which he received from the railroad administration. According to the report, the local salt works ranks first in the United States west of the Mississippi river and fourth in the entire country. Approximately 100 men are employed at the plant annually. The government purchases a large portion of the output of the Saltdale works, and the remainder is distributed throughout the western part of the continent. LARGE OUTPUT—The product mined at the Saltdale works is known as Desert Salt, not less than three carloads being shipped from the plant every day. Some days as many as many as eleven carloads are sent out from the mine. The plant is complete in every detail, the entire product of the mine being refined in Saltdale and distributed direct from there by rail. The population of Saltdale is 130, the small town having grown and flourished around the plant, which is operated by electricity supplied by the Southern Sierra Power Company, which serves the eastern part of Kern County. The town although small is modern in every particular. 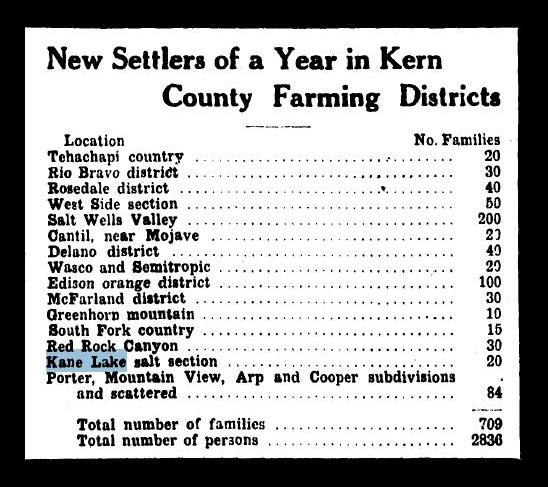 September 10, 1927: “LONG BEACH SALT CO. BUYS CLAIMS AT KANE SPRINGS—Enters Red Rock Mining District on Transfer From Fremont Company.—Involving one of the biggest mining deals in Kern County this week, the Fremont Salt Company has sold 111 claims comprised in its property at Kane Springs, near Red Rock mining district, according to an agreement recorded yesterday, making the transfer to the Long Beach Salt Company. Dr. George Buchner, president of the Fremont Salt Company, was out of the city yesterday and details as to the mining deal could not be ascertained. Jnly 20, 1933: “MINING LOCATIONS—Long Beach Salt Company—Million Fleir, west half of southwest quarter of southwest quarter section 36, 29-31. July 17, 1937: “KERN DESERT AREA CONTAINS SALT PLANT AT DRY LAKE BED—Mojave, July 17.—Glistening in the desert sun 18 miles northeast of Mojave lies the great Saltdale, Dry Lake, the lowest pint in approximately 1000 square miles of desert land. M. C. Topp, superintendent, this bed of dry salt has been refined and marketed by the Long Beach Salt Company for the past 30 years. At the present time a new crop of approximately 10,000 tons of salt is being completed by evaporation process. The plant runs a capacity of 50 tons per day. Salt is hauled from the vats to the mill by use of a small private railway. Men are now at work repairing the exterior of the mill and rebuilding the railroad. January 1, 1940: “SALT MINED IN BIG KERN DESERT AREA—Saltdale, Jan1.—From the lowest point in approximately 1000 square miles of desert land, salt is taken from the Saltdale Dry Lake here. For the past 30 years the salt has been refined and marketed by the Long Beach Salt Company. October 7, 1942: “GIANT SALTDALE PLANT BETWEEN MOJAVE AND RANDSBUG PRODUCES WAR MINERAL—Resembling a mammoth ice-skating rink midway between Mojave and Randsburg on the fringe of Kern’s vast Mojave Desert, Saltdale dry lake, where the Long Beach Salt Company of Saltdale is situated, is a white blanket from which is “harvested” almost chemically pure sodium chloride from one of the nation’s leading producers of salt. “This is our ‘salt crop’ season,” H. C. Topp, superintendent of the Long Beach Salt Company, who is Saltdale’s “town man” as mayor, postmaster, and constable, said today. Most of the Saltdale-produced salt is shipped in bulk, he said, and used by some tons for their water-softening systems, by cattlemen for salting cattle, and by oil refineries. Portion of the salt is refined for table salt under the brand of Blue Cross table salt, Topp added. Always moist, the floor of the gigantic lake consists of black mud following rain, impregnated with salt crystals. Water comes to the surface by capillary action. The water, which is “fed” into the dry lake following rains from a surrounding area of more than 1000 square miles involving Tehachapi, Carman Wash, Pine Tree, Jawbone, Red Rock, Last Chance, Fiddler’s Gulch, and Randsburg, evaporates with heat, leaving a dry, moist floor. “All rainwater in the region is tributary in the lake, pouring water into it, as the lake is the lowest point in the surrounding area of 1000 square miles.” Topp declared. Production of salt is dependent entirely on rainwater “feeding” the dry lake, he added. Topp explained that brine water is pumped from the lake into large vats, and when the water is evaporated a layer of salt and brine from 6 to 8 inches in thickness is “caked” in the vats. Workmen slice the gigantic “salt cake” into bulky rectangular pieces which are placed on small rail cars and transferred to the nearby plant for shipping. The Saltdale plant is equipped with 6 vats, averaging 5 acres each, including one new 8 acre vat. Ten men are working at the present time, cutting “salt cakes: installing pumps or “ditching” in preparation for fall rains. As many as 2o workers will be employed, according to Topp, who admitted he is among the legion having labor-shortage troubles. He pointed out that salt is used for black powder, all plastics and certain types of synthetic rubber compounds. Salt “harvested” from the Saltdale Lake is 98.5 per cent pure sodium chloride. Big buyers of the Saltdale product, Topp stated, are sheepmen and cattlemen, Cattle, horses and goats lick salt, he explained, while sheep eat it, and for this reason, the salt is placed in 50-pound containers for sheepmen, because it facilitates distribution. Participating in a Kern County Chamber of Commerce tour of the Saltdale area under the direction of Mr. Topp and Mr. Hubbard, were secretary-manager Emory Clay Hoffman, Supervisor C. W. Harty and Cecil Wise, justice of the peace in Randsburg. The Saltdale trip was the third of a series of “war tours” of the eastern Kern desert area authorized by the Board of Supervisors under direction of Mr. Harty, The tour was under direction of Paul Hubbard, Randsburg publisher and director of the Kern County Chamber of Commerce for eastern Kern County. March 9, 1919: “SALTDALE RESIDENTS ARE AGITATING FOR A SCHOOL DISTRICT—Establishing of a school district at Saltdale is being agitated, as the residents of Saltdale claim fifteen children of their town are of school are. Saltdale is situated on the dry salt lake in Fremont Valley, between Randsburg and Cantil and in a place where the getting and shipping of salt is the only industry. If the school is established, the residents want it to be as a part of the Randsburg district. The latter place has previously had three teachers, but this year it was found necessary to employ only two. March 20, 1919: “SALTDALE TO OPEN NEW SCHOOL AT RANDSBURG—A new school in connection with the Randsburg school, and Miss Mamie Silva, a graduate of the Fresno Normal school, will be in charge. The town is a small one on the banks of the dry salt lake on the Mojave Desert. There are 17 children in the district and there has never been a school there. March 22, 1919: SALTDALE AWAITS ITS NEW TEACHER –Randsburg, March 22.—Saltdale will have a school of its own, just as soon as Superintendent Chenoweth furnishes a teacher, which he has been asked to provide as soon as possible. In March of 1918, D. H. Guyer, manager of the Fremont Salt works, owned by Bakersfield capitalists, appealed to the correspondent of the Californian to assist in securing a school for Saltdale, but 1918 being election year, little headway was made. Recently the Randsburg trustees took the matter up, and President Seth Tyler arranged to equip Saltdale with down-to-date school furniture for 15 scholars, if the citizens of the district would provide the school building, which they have done, and the full equipment is now on the ground. The school will open with 15 scholars, as soon as the teacher is secured. The money for the furniture was appropriated from the surplus held by the Randsburg trustees. October 8, 1919: “HIRE TEACHER FOR SALTDALE SCHOOL—Saltdale School has at least a teacher. Miss Anna Hopkins of San Gabriel, but there is controversy over the location of the school as each of two salt companies which are several miles apart demand that the school be in the immediate vicinity of its works. March 3, 1920: “SALTDALE TO OPEN NEW SCHOOL AT RANDSBURG – A new school will be opened in Saltdale in connection with the Randsburg School, and Miss Jamie Silva, a graduate of the Fresno Normal School, will be in charge. The town is a small one on the banks of the dry salt lake on the Mojave Desert. There are 17 children in the district and there has never been a school there. April 3, 1921: APPORTIONMENT GIVEN SCHOOLS—Apportionment of the sum of money set aside by the board of supervisors for the support of Kern county schools was completed by the county superintendent of schools yesterday. The amount of the county fund is $289,050 and is apportioned on a basis of $450 a teacher and ___a pupil on the daily average attendance. July 21, 1921: “SCHOL DISTRICT WITHOUT A PUPIL—Saltdale Petitions for Annexation; Others to Be Merged—A school district with neither pupils nor trustees, is the description of the Homestead district, once a flourishing community, now without even a soul to care for the school interest. It is represented solely by a black box, in which repose various documents relating to the school. This is one of the names appearing upon a list of schools which have not enough attendance to warrant keeping them open next year. The county board of supervisors are to be notified of the fact by the superintendent of schools. If the inhabitants of the small districts can guarantee a sufficient attendance the schools will be opened, otherwise they will be merged with other and larger districts. The following, in addition to Homestead appear on the condemned list: Arroyo, Blake, Castle Rock, Duncan, Johannesburg, Poso Flat, Red Rock, Saltdale and Sunflower. Parents of school children in the Saltdale district have presented a petition asking that they be annexed by the Garlock district. The paper has thirteen signers, and will be acted upon by supervisors at their August meeting. April 20, 1931: “MINING CONTINUES—Mining in this county is far from being through, according to Mr. Metzner, who said he had recently completed a survey of the Piute, Caliente, Randsburg and desert mining districts of the county and found persistent and lucrative activity despite a period of depression. Of tremendous importance in this county is non-metallic mining, Mr. Metzner said. Borax deposits here constituting a world monopoly, are sufficient for 500 years. The Saltdale district, he explained ships 2000 tons of salt a week and has a capacity of 10,000 tons a week. May 19, 1932: “LOWELL W. WERT IS CLAIMED BY DEATH—Lowell W. Wert, 53, died at a local hospital. He was a native of Ohio and had resided at Saltdale for 11 years. He leaves a son, Robert J. Wert, of Saltdale; two daughters, Mrs. Lola Jones of Mojave and Mrs. Maude Boyle of Glendale, and a sister, Mrs. Lizzie Underwood of Saltdale. March 2, 1933: “CHAMBER OF COMMERCE TO PAY VISIT TO MINING AREA—Route of the second scenic tour to be sponsored by the tourist and travel committee of Kern County Chamber of Commerce was announced today and on March 11 and 12 will take scores of southern San Joaquin Valley motorists on a colorful trip into the mining and Tehachapi mountain areas to the east and south of Bakersfield. The tourist committee s conduction the tours with the major objective of acquainting citizens of Kern with the natural wonders, historical romance and scenic advantages of their county, according to E. W. Smith, chairman. Other members of the committee are Thomas W. McManus, James K. Thrasher, Howard Scott, Fred Widmer and Malcolm Brock. As shown in the accompanying map, the March 11-12 journey will take the motorcade into the most interesting sections of the state. Leaving the Padre hotel, Bakersfield at 8 o’clock Saturday morning, the travelers will journey though Kern River Canyon, where history has been written since the days of ’49 when thousands of miners lived in the gold-producing area around Kernville, then ”Whiskey Flat.” Traveling through Walker’s Pass the motorists will journey on into scenic Red Rock Canyon, where they will partake of a picnic lunch to be supplied by the individual members of the caravan. From Red Rock they will go to the petrified forest, once the home of prehistoric animals, and then on to the salt works at Saltdale and the Dutch Cleanser mines. Leaving the mines, the travelers will drive to Randsburg, last town of southern California devoted exclusively to mining. On Sunday, March 12, the party will visit the famous Yellow Aster gold mine, as well as other famous mines of the district; visit the borax deposits near Kramer, largest in the world; inspect the great cement plant and deposits at Monolith, new California State Institution for Women near Tehachapi and the Preventorium at Keene before returning to Bakersfield. December 5, 1933: “WILLIAM T. STEVENS SERVICES CONDUCTED –The body of Saltdale pioneer miner and prospector of the Piute and Mojave Desert districts who died in a local hospital Friday following a long illness, was laid to rest in the perpetual care section of Union Cemetery Monday following funeral services conducted by the Flickinger-Digier chapel. The Rev. John Murdoch, pastor of First Presbyterian church, officiated at the service. December 30, 1935: “MOJAVE RESIDENT, SALTDALE GIRL WED—Mojave, Dec. 30. –Pastor Aguilera of Mojave and Miss Clara Medina of Saltdale were united in marriage at the home of the bridegroom in a quiet ceremony performed Christmas Eve by Judge George W. Arper. A few close friends witnessed the ceremony, after which refreshments were served and the couple drove to Los Angeles, to return before New Year’s Day. August 11, 1937: “MR. AND MRS. C. H. LING, Miss Maurine Ling and Mr. and Mrs. Whitehall and daughter of Saltdale visited at the Bob Nelson home on Sunday.” –Bakersfield Californian. June 6, 1939: “HOMECOMING—Saltdale, June 6.—Former students at the Saltdale Elementary School who have established their residence at other points returned here for the annual homecoming at the school with Mrs. Caroline Engle, instructress, as hostess. Special guests included the school’s first graduate, Mrs. Jose Naraz, who completed her studies eight years ago; Henry Vasquez, a graduate of the class of 1935; Joe Martinez, Pete Ramos, Arthur, Elvira, Eugene, Angelita Vasquez, all of Tehachapi and Tonia and Humberto Salazar of Trona.” –Bakersfield Californian. August 21, 1939: “PARTY, IN SALDALE FETES BRIDE-ELECT—Saltdale, Aug. 21.—The home of Margaret Topp was the setting for an attractive arranged miscellaneous bridal shower given in honor of Miss Maurine Ling, the daughter of Mr. and Mrs. Herman Ling of Last Chance Canyon, who in September will become the bride of William Gagon, the son of Mr. and Mrs. W. W. Gagon, of Mojave. Following the presentation of gifts Miss Ling cut and served a bride’s cake decorated with a miniature bride and bridegroom, which was a family heirloom belonging to one of the co-hostesses, Mrs. Caroline Engle. Table appointments expressed a pink and blue color scheme. Serving with Mrs. Topp and Mrs. Engle was Mrs. Margaret Tisch. November 17, 1939: “CHILDREN HONORED AT SALTDALE FETE—Saltdale, Nov. 17.—Games were the diversion of the afternoon when Mrs. William Whitehall entertained recently a group of children in honor of the eighth birthday anniversary of her daughter, Joan Whitehall, at the family home in Last Chance canyon. Attending were Natie Rios, Frank and Christina Pecheco, Vincent and Viola Cedano, David Lee, Martha and Shirley Willis, Esther and Franklin Pappas, all of Saltdale, and Shirley Martin of Mojave. August 12, 1940: “AGED MAN FEARED LOST ON DESERT: “Deputy Sheriff Don Brink and Constable Frazier, Randsburg, today scoured the Rand Range 10 miles south of Randsburg for E. R. Bostwick, 67, retired resident of Long Beach who has been missing since early Sunday morning. August 22, 1940: “COLORFUL AS A GARDEN—RARE REEVES, PARTRIDGES AND PEACOCKS FLOURISH IN DESERT AVIARY AT SALTDALE—Mojave, Aug. 22—More colorful than a flower garden and easier to raise on the dry Mojave Desert are the brightly feathered birds in the aviary of Mr. and Mrs. H. C. Topp of Saltdale. Mr. and Mrs. Topp, residents of the desert for 18 years, launched their hobby several years ago when they procured a number of Japanese chickens to ace as parents for broods of baby chicks. From this beginning grew the collection which now includes more than 100 birds from many distant countries as well as numerous species of desert bird life. Starting with a trio or pair of birds, a small brood of each species is raised annually, the present collection being compromised of silver and golden pheasants, natives of China; chucker partridge from India, peacocks, reeves, desert and valley quail and other European and American game birds. Although he considers the reeve his most valuable specimen, Mr. Topp has found the chucker or Indian partridge most interesting in its habits. The male chucker, naturally polygamous is noted for battles with its mates, in which the female is frequently scalped, losing her distinctive crest. Young birds are hatched in incubators to prevent eggs laid in unshaded spots from being baked by intensive sun. Once hatched, Mr. Topp reports, the birds are well able to withstand desert climate despite differing conditions in their original habitats. February 9, 1917: “SALT INDUSTRY OF KERN COUNTY TO BE EXPLOITED—Local Residents Organize to Handle Great Deposits in Dry Salt Lake –The salt refining industry of Kern County, hitherto practically untouched is to be exploited by the Fremont Salt Company, organized by local residents, which holds 2249 acres of land on the Dry Salt Lake in the Randsburg district. Operations are to be started within the next ten days and a $10,000 plant is to be erected this spring for the first season’s run. The proposition is said to have unlimited possibilities inasmuch as the salt deposit is one of the largest in the west and as a considerable portion of the land is rich in potash and borax. The salt is to be handled first, according to present plans, the first unit of the plant being established to handle 25,000 to 40,000 tons during this coming season. Later additional facilities will be provided so that the output may be increased to 150,000 tons or more per season. EXPERIENCED SALT MEN—The operations of the company are to be under the direction of D. H. Guyer, formerly with the Consolidated Salt Co., which has operated for two years in Dry Salt Lake and Paul Greenmore of this city. The Consolidated has shipped out about 100,000 tons of salt valued at $500,000 or more. Guyer has been engaged in salt refining for years and is said to be a highly capable man. The company has a paid up capital of $60,000 with an authorized capital of $1,000,000, the stock subscriptions being closed at the present time. Seventy-five percent of the stockholders according to Greenmore, vice president of the company, are local people. R. O. Quackenbush, engineer for the Southern Pacific, is president of the corporation; Greenmore, vice president; J. B. Crandall, secretary; Leonard Haupt, treasurer; Grant T. Johnson, W. B. Silber, R. G. Libby, C. V. Morrison, and Mrs. Walter Osborn, directors. RAILROAD FACILITIES—The broad gauge line of the California & Nevada railroad runs through the Fremont Salt Company’s property, affording easy transportation of the product. Greenmore reports that an abundance of water may be obtained at a depth of about 40 feet. The lake itself is dry during the winter months, holding during the summer a body of water drained from the Mesquite, Goler, Last Chance, Nugget and Red Rock Canyons on the north side and from a rolling slope on the south side. There is no outlet. The new company plans to operate in somewhat the same manner as the Consolidated, making large vats with a steam shovel, where the salt solution is evaporated, but will use a new system of evaporating the solution, after it holds about 96 per cent salt, thus eliminating the expensive process of breaking up the salt cake which ordinarily forms about four feet deep on the floor of the vats. Solar evaporation is aided by the high temperature which is upward of 140 degrees from July to September. A PURE PRODUCT—It is claimed that the salt evaporates 99 per cent pure, the product when crushed being used for table purposes, packing and dairying. Salt is now at the highest price in years, selling at from $10 upward per ton. Greenmore claims that the cost of the salt to the company loaded on the cars will be little more than $3 per ton. August 5, 1917: “ASSESSMENT NOTICE –Fremont Salt Company: Location of principal place of business, Bakersfield, California; Location of works, Saltdale, Cal. Notice is hereby given that at a meeting of the board of directors held on the 18th day of July, 1917, an assessment (No. 1) of one (1) cent per share was levied upon the capital stock of the corporation payable immediately in United States gold coin to the secretary at the office of the company 1510 13th street, Bakersfield, Cal. Any stock upon which this assessment shall remain unpaid on Tuesday, the 28th day of August, 1917 will be delinquent and advertised for sale at public auction and unless payment is made before, will be sold on Saturday the 18th day of September, 1917, to pay the delinquent assessment, together with the cost of advertisement and expenses of sale. March 24, 1922: “FREMONT SALT CO. SPENDING $30,000—The Fremont Salt Company which has large holdings at Toby on the Mojave Desert is putting in improvements at the present time to the amount of $30,000. Chief among these is the laying of a railroad from the holdings to connect with the Southern Pacific at Toby. The track extends one mile and a half and will be of the narrow gauge type. The mill and refinery for the salt will be at the railroad terminal. The project is an extensive one and owned by local men. Dr. C. H. Buchner is the president of the company.” –Bakersfield Morning Echo. August 17, 1922: “THE FREMONT SALT CO. with headquarters in East Bakersfield at 900 Baker St., have just closed a $10,000 deal which entitles them to the equipment for constructing a two-mile railroad track to connect Saltdale, where are situated their mill’s and vats, with the Southern Pacific Jawbone line at a point 15 miles west of Randsburg. The rails to be used are now stacked at Lancaster. The ties, which are of steal are joined together and are easily portable. Mine “dump” cars and one flat car were also purchased for a consideration of $90 each. The engine to be used by the Fremont Salt Co. is being built in a local machine shop. The deal was made through George C. Peamossa, a Long Beach contractor who is located at present near Randsburg. 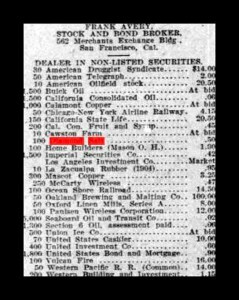 December 8, 1922: “NOTICE OF SPECIAL MEETING TO DECREASE CAPITAL STOCK of Fremont Salt Company. NOTICE: Is hereby given that a special meeting of the stockholders of the Fremont Salt Company will be held on the 27th day of December, 1922, at seven thirty o’clock P. M. at the office of the Company at 317 Baker St., East Bakersfield, California for the purpose of voting upon the proposition to decrees the common capital stock from one million dollars, consisting of one million shares of the par value of One Dollar per share, to Two Hundred Thousand ($200,000) to consist of Two Hundred Thousand shares of the par value of One Dollar each. April 22, 1924: “NOTED FILM STAR’S SON AND AVIATOR ARE VISITOR HERE – Interest of guests and callers at the Tegeler Hotel was aroused tody when it was learned that the tall young man registered as Ralph E. Bushman of Los Angeles is the son of Francis K. Bushman, motion picture star, and that his companion, Charles W. Cradick, is the former Lieutenant Cradick of the 94th Aero squadron, U. S. A., accredited with having brought down nine German planes during the World War. Young Bushman was for a number of years in pictures himself, but he has temporarily, at least, deserted the silvered screen for salesmanship activities. 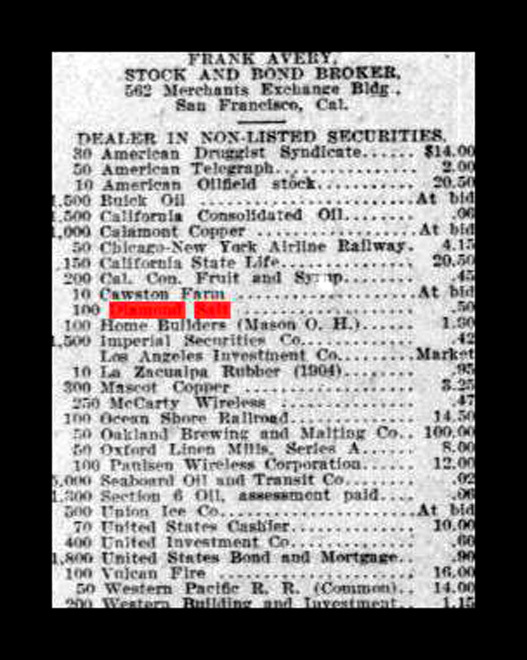 Cradick and Bushman comprise the “flying squadron” of Charles W. Craddock Company of Los Angeles and are here for the purpose of presenting a $100,000 special issue of stock of the Fremont Salt Company too Bakersfield investors. Dr. George H. Buchner, of Bakersfield is president of the company, a local concern, now operating in this county. 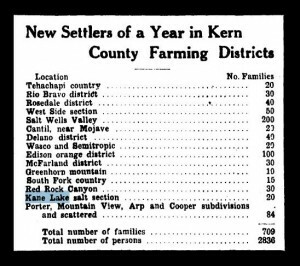 December 10, 1927: “LONG BEACH SALT CO. BUYS CLAIMS AT KANE SPRINGS—Enters Red Rock Mining District on Transfer From Fremont Company.—Involving one of the biggest mining deals in Kern County this week, the Fremont Salt Company has sold 111 claims comprised in its property at Kane Springs, near Red Rock mining district, according to an agreement recorded yesterday, making the transfer to the Long Beach Salt Company. Dr. George Buchner, president of the Fremont Salt Company, was out of the city yesterday and details as to the mining deal could not be ascertained.